The successful event took place on Sunday, Oct. 14 to generate awareness and raise funds. Seeing the sheer number of people who showed up was humbling. We know that this money is going to an amazing cause, in honor of an amazing person, and that means everything to us. 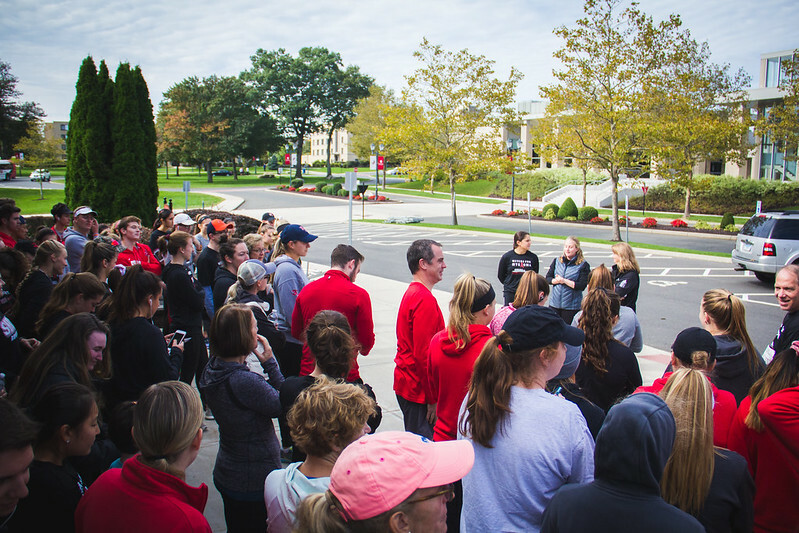 On Sunday, October 14, 2018, Fairfield University’s Men’s and Women’s Rowing Teams hosted their third annual Meters for Myeloma 5K run in memory of Matt Labine, beloved Fairfield Rowing Coach who passed away in September 2017 after his battle with multiple myeloma. In addition to Coach Labine, the event also honors Jo Hannafin PhD, friend of the Rowing Team at Fairfield University. Meters for Myeloma began in 2017 after an initiative by the University rowing teams to dedicate more time to community service. The event made perfect sense because earlier that year, assistant coach Matthew Labine had been diagnosed with multiple myeloma and was receiving treatment. Following the news of Labine’s diagnosis, the team decided to center its service project around multiple myeloma in his honor. This year, the event was organized by Kelsey Carthew '19, Lina Foncello ‘19, and Aileen Morley-McLaughlin ‘20., and was co-sponsored by the Office of Residence Life and Fairfield Athletics. “Matt taught us how to row. He brought us into a sport that we are all so passionate about, and he brought us all together to become the family that is Fairfield rowing. This event is so small in comparison to what he gave to us; it’s the least we can do to honor him,” says Carthew about what the event means to her and to the Fairfield University Rowing community. The event was open to the public with the hope of getting as many members of the community as possible to come out and show their support for finding a cure for myeloma. Around 130 individuals participated in the event and a total of $6,445 was raised. Carthew vowed that this event will continue in the future and will keep growing bigger. Proceeds from the 5K will be donated to the Multiple Myeloma Research Foundation (MMRF), whose effort to offer cures to myeloma patients involves heavy research into potential treatments and medications. Multiple myeloma is the second most common blood cancer and currently there is no cure, but by raising funds for awareness and research, strides can be made towards putting an end to this disease.